Leadership is your ability to respond to what the world sends your way. Becoming masterful at leadership requires courage, vulnerability and patience as a life-long practice. The courage to confront your truth. The willingness to be vulnerable with those around you. The patience with yourself as you stumble, fall and pick yourself back up to keep going knowing your Leadership is needed in this world. Developing yourself as a leader is about far more than simply taking a course, reading some books and telling others what to do. Leadership starts by always wanting to know yourself deeper than ever before. When you start with knowing yourself it allows you to be the best version of you possible. Responsibility is understanding and seeing your normal reactions to things happening all around you. Mastering your Leadership will become a life-long journey. Throughout your exploration of your Leadership, we will deepen your understanding of yourself in many ways. It’s been my experience, through this practice, you will ignite a deep curiosity to understand yourself as this is the core of being a great leader. When things are going perfect leadership tends to be fairly straight forward. Given the complexity of the world, how often do things go so smooth? Every day we are faced with problems and upsets and Leadership is about your ability to respond from a mindset of Responsibility. Your practice of Responsibility starts with an intention to operate from a mindset of Responsibility. 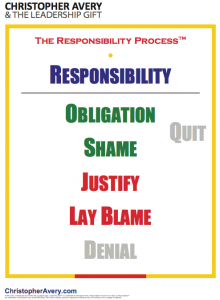 The Responsibility Process® provides us with the framework by which to learn, build awareness and practice responsibility. It is through this practice you can be truly free, powerful and at choice with your Leadership and life. The Responsibility Process is the result of several decades of research by Dr Christopher Avery. 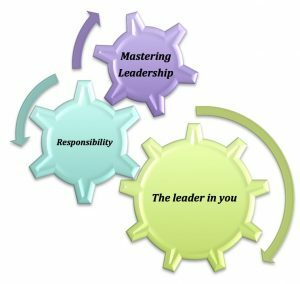 As a recognised The Leadership Gift® Coach, I teach, mentor and coach my clients as they start their own practice of Responsibility. Through seeing what mindset you are approaching a problem, you can expand your practice of Responsibility and become increasingly Response-able. Regardless of what you choose, you will always be encouraged to deepen your Leadership practice through ongoing exploration. I can be an ongoing part of that journey, or I can simply help you establish the path you want to start pursuing. Finding an impactful Leadership program for you and/or your team can be a little like finding a needle in a haystack. Are you ready to explore how my Leadership program will help your practice?